The chariot of the body. The five horses represent the five senses (tongue, eyes, ears, nose and skin). The reins, the driving instrument, symbolize the mind, the driver is the intelligence, and the passenger is the spirit soul. In the last post we find that the soul is covered by layers of the subtle body and gross body. Each layer covers or alludes the soul in disassociating with its true self. This is called ego or thinking that we are the body. 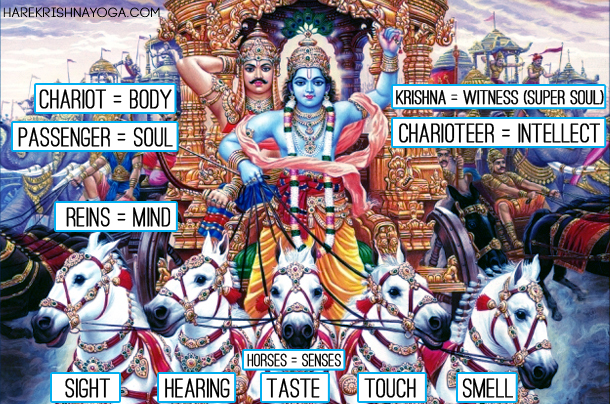 Arjuna's chariot is an analogy which illustrates the roles each layer of the subtle and gross body plays. The chariot carries the passenger (Arjuna) in the same way that the material body is the carrier of the soul. The chariot can only be driven with the presence of the charioteer which is the intellect. The battle ground is the object of the senses. The 5 horses are the 5 mighty senses which are tamed only by the reins (the mind). The mind is superior to the senses and even higher than the mind is the intellect or the charioteer that grips the horses reins. The soul teamed with intellect drives the body and instructs the mind to control the senses. If the intellect is weak and unable to control the mind, then the senses will run wild like untamed horses. Srila Prabhupad says Intelligence is supposed to direct the mind, but the mind is so strong and obstinate that it often overcomes even one's own intelligence. Such a strong mind is supposed to be controlled by the practice of yoga, but such practice is never practical for a worldly person like Arjuna. And what can we say of modern man? The simile used here is appropriate: one cannot capture the blowing wind. And it is even more difficult to capture the turbulent mind. The easiest way to control the mind, as suggested by Lord Caitanya, is chanting "Hare Krsna," the great mantra for deliverance, in all humility. The method prescribed is sa vai manah krsna-padaravindayoh: one must engage one's mind fully in Krsna. Only then will there remain no other engagements to agitate the mind. The soul or Atma sits besides the super-soul or Parmatma who is an expansion of Krishna himself. The super-soul is the divinity within that acts as the witness to all our endeavours, thoughts and prayers and our eternal best friend that gifts us with intuition and guidance. Krishna in the form of super-soul is within the heart, sitting patiently until the day that the soul breaks through the layers of the gross and subtle body and realises his true self, remembering his eternal relationship with Lord Krishna. i also would refer 5 horses as Wisdom, Faith, Will, Disciple & Love. If any of us have these 5 character, he is the Human being in real sense. Hare Krishna, thank you for your comment. Yes, if we can control the 5 senses then surely these 5 qualities you mention can flourish! This is misleading - the analogy was from the Puranjana pastime in 4th Canto. We can't apply it to Krishna - It amkes it appear like it was all just symbolism and didn't really happen. Hare Krishna, thank you for your comment and for bringing my attention to the past time that you refer to. Perhaps I was not correct to use this particular chariot belonging to Arjun and Krishna, but what it does represent is that Lord Krishna is present within us as super soul. Surely everything can be linked to Lord Krishna which is why I wanted to include Lord Krishna in the image.